The subject on the Italian antique cameo jewelry pictured above, is the sun God Apollo seated on his chariot at break of day, bringing daylight into the world, rising with AURORA, the Ancient Greek goddess of the Dawn. Love You to Join Us! It might come as no surprise to know that the finest Cameo Jewelry is made in one of the most magnificent countries on earth - That's it.....Incredible Italy! There is so much to see and do in Italy! Jen has reviewed 100 top things to do in Italy besides the Liverino Cameo Tour offered below. if I were new to investing in cameo Jewelry I would absolutely love to learn all about Italian cameo Jewelry in Italy, BY THE MASTERS THEMSELVES and not from behind my lifeless computer screen. So I decided to offer my subscriber guests an unforgettable escorted tour of the Cameo Jewelry capital of the world - ITALY in June 2019. Purchase cameo Jewelry at discounted prices on tour, immerse yourself in the sights and sounds of incredible Italy while learning all about Cameo Jewelry from the masters of antique Cameo, and not to mention the fun you will have being in the company with like-minded people who enjoy Cameo Jewelry and Italian life and culture. Our cameo travel to Italy tour will take in many of the sights and sounds of Naples, and you will see Cameo jewelry being carved by the Italian masters themselves just like the Victorians did when they traveled on the grand tour over 100 years ago! 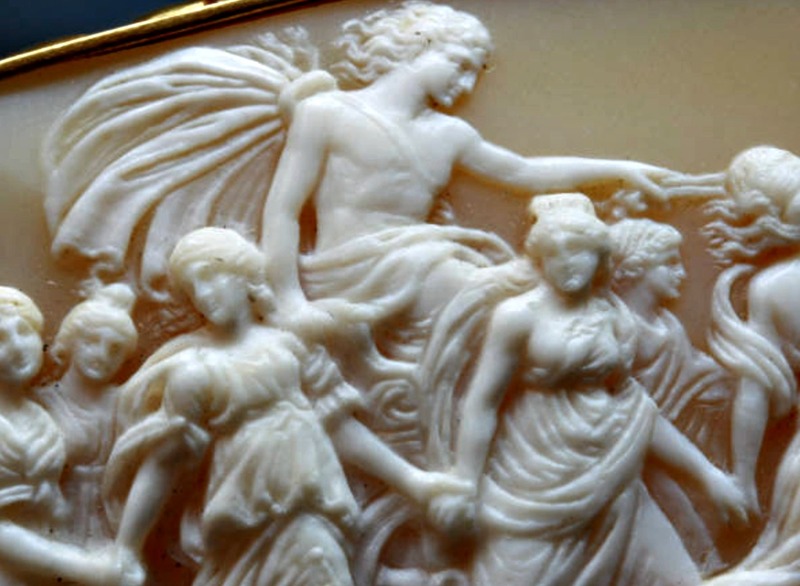 Return with a deeper understanding and appreciation of cameo art and gain greater knowledge about cameo jewelry , than many of the cameo experts. There is nothing that compares to first-hand, working knowledge and experience. You will also have the chance to invest in Cameo jewelry in Italy and receive helpful guidance (which could save you the cost of the tour) from Cameo and Jewelry experts. So, what are you waiting for? Join us, for learning, laughter, buying & fun, meet new friends in real life who share your love of Cameo jewelry, Italian art and culture. Even if you know nothing about cameo jewelry but would like to learn, I can't think of a better way to start a Cameo jewelry love affair than this offer. A tour of the famous Liverino Museum of Cameo & Coral Jewelry is not to be missed and included on this tour! If you would like to join us on the Antique Jewelry Investor grande cameo tour to Italy in 2019 express your interest by filling out the form below. We will get back to you within 48 hours with further details and prices. Don't miss out! Join us on a Cameo Tour of a Lifetime to Italy - WHEN? June 2019! What Is An Antique Cameo? Technically, the cameo both modern and antique, is a carving made from a single piece of hard-stone, coral or shell material. If the carving was created over one hundred years ago, it is officially described as an antique cameo. Cameo over a century old contain two other important qualities not found in its modern day cameo sister; Rarity and Age Appeal. A cameo is the name for a relief that is cut so that it is raised above the background. An Intaglio is the name for engraving with a negative image, as used for seals. When a carving is successful, you will not be aware that color has been used deliberately to make the carving pleasing to the eye. Only after examining the composition of a cameo carving is the adroit use of color recognized as a primary reason, that the work of art is so satisfying. 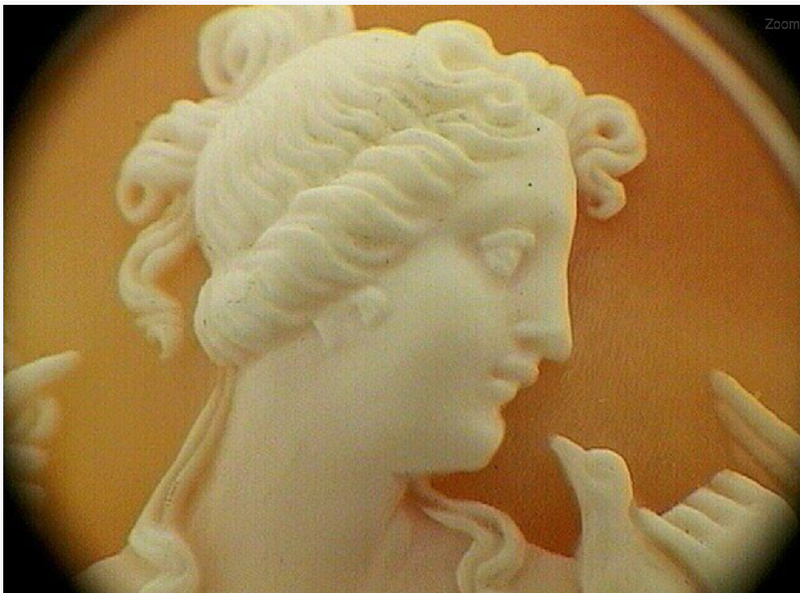 An oval white background can form a background for the design of the cameo, which may be a reddish color for example, of shell or carnelian. Classic Old Cameos often reveal scenes of classical history, depicted in the form of classical mythology. One of the most famous Cameos in retrospective time, according to the History of Cameo is the legendary - TAZZA FARNESE. This famous cameo of antiquity can trace it's origins all the way back to 31 BC! The reason that the Tazza Farnese can do this, is because of the material it was carved from - Sard Onyx, a semi-precious stone and relatively hard in comparison on the Mohs Scale. The popularity of French and Italian Cameo Jewelry is not only due to their incomparable beauty and fine craftsmanship but also the fascinating Ancient Greek mythology that provides the inspiration behind many of the meticulously carved scenes. Most Italian cameo jewelry on the market today, date from the mid-1700s to 1900. Cameo jewelry was traditionally made by carving in coral, conch shell, onyx, agate, sardonyx, and various other minerals and gemstones. Ivory, lava, and wood are also used, however some experts do not believe they make "real" cameos. The reason is that the latter materials do not rank very high on the Mohs Scale. Cameo Carving motifs range from the ancient Greek mythology to the romantic profiles or floral displays. If you are investing in cameo jewelry, have in mind that the much overused female portrait bust carved from a shell is not, unless unusually well carved, a prime example of cameo work. A beautiful pair of Cameo earrings, for example, will not only stand up to close inspection but they will also hold their own from a distance. Try to imagine the cameo in your mind as a larger picture. Consider the elements of color, composition and balance. The cameo jewelry market is Big and Climbing and there is a definite trend toward younger buyers with an eye for quality. A cameo ring usually sells best and well carved antique cameo earrings are always in demand. Check to see that the subject is artistically carved, not too worn and not flawed. Inspect the antique cameo jewelry under strong light for any stress lines, preferably with a jewelers lope. Any lines or fractures will significantly affect the cameo's value. Always store cameo jewelry separate from other types of jewelry and in a dust-free environment.